If you recognize the case design you'll see that the inspiration draws from the Sinn 140 and Sinn 142 series, all of which were chronograph watches. 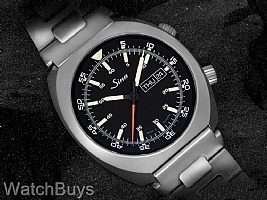 The new Sinn 240 St preserves the classic look of these watches but simplifies the design with time, day and date. And although this watch does not feature traditional chronograph functions, Sinn has incorporated an internal rotating pilot's bezel activated through a crown at 2. Verified Owner Comments: I've had the watch now for two weeks and I'm very pleased with virtually all aspects of this timepiece. It arrived promptly. It is keeping excellent time and I'm impressed with the legibility and clarity of the dial as well as the overall quality of the watch. Looks every bit as good in person as it does in pictures. It's also very comfortable on the wrist. My only suggestion for improvement would be to secure the internal bezel a bit more firmly as it tends to drift. Aside from that, don't change a thing! Verified Owner Comments: The 240 St is a superior watch for legibility, comfort, and versatility. Lume is good and the overall quality is what you would expect from Sinn. The only downside is that the crow for the internal bezel can move inadvertently. A small but sometimes noticeable thing. Maybe Sinn can make it a screw down crown on the next gen. Otherwise thumbs up.